Visiting not only highlights like Pokhara and Chitwan, this trip gives a taste of the variety of places and things to do that Nepal has to offer. You explore the rich cultural heritage of Kathmandu and the Valley where you see a fascinating mix of Hinduism and Buddhism. Staying a night with a family in Panauti and then another night in a monastery, you get to see different aspects of the best of Nepal. You visit Tansen, a lovely old town where few tourists go. No trip would be complete without a visit to Pokhara where you can relax and admire the Annapurnas as they appear to shimmer over the beautiful Phewa Lake. Finally, you spend a couple of nights in Chitwan in a Tharu village. Here you go on a jungle safari and if you are lucky, you might even see a tiger. Staying at a homestay can be the highlight of your trip. You can live like a local, sharing with families their way of life. The homestays are family homes, so whilst they offer a good standard of comfort, they may not be quite as luxurious as a hotel. Meals provided at homestays are prepared by the family and generally there will not be a choice as this is what the family will be eating too. However, guests with any special dietary requirements should make this clear beforehand. For example, anyone how cannot tolerate wheat flour would not want to be served chapattis or momos, so should warn their hosts on arrival. Water served at the homestays is filtered and all hosts and hostesses have been trained in the hygienic preparation of food. In many places, guests may be offered local chyang or raksi, a beer made from rice or grain, or a spirit distilled from the same. In most of the places where there are homestays, you can be taken by your host family to see the local sights, or to participate in local activities, depending on where you are staying. In many homestays, the level of English may be quite basic. Generally, younger people will know more English from school, but their parents do not always speak so much English. That said, many of the homestay hosts and hostesses are learning English and will welcome the chance to practice and interact with you. It is best to bring Nepali rupees and try to bring as much small change as you can, as in the villages cashing larger 1000Rs notes is always more difficult. You should exchange enough money into Nepalese rupees to last the entire time of your trip as outside Kathmandu and Pokhara, there are very few ATMs and no money changers. Although Indian rupees may be accepted in many places, nowhere will accept foreign currency as it is very difficult for local people to then change into Nepali rupees. Mobile phone reception can be very patchy. Although NCELL, the local mobile company has quite good coverage, sometimes the signal can be very weak. Many homestays offer wifi, which also can be quite variable in speed. Tipping is a personal and voluntary matter and is not included in the trip price. If you wish to reward the efforts of those who have worked to make your trip the best they can, we suggest the following: USD 4 per day for groups of 8+, USD 5 per day for smaller groups. Travel insurance is not included in the trip price. It is essential that you take out comprehensive travel insurance prior to your trek. Your travel insurance must provide cover against personal accident, medical expenses, emergency evacuation and repatriation (including helicopter evacuation) and personal liability. We also recommend that it cover cancellation, curtailment and loss of luggage and personal effects. There are no specific health requirements for entry into Nepal. You should consult your doctor for up-to-date information regarding vaccinations, and medications for any reasonably foreseeable illnesses whilst traveling in Nepal. Please be aware that you will be in remote areas and away from medical facilities for some time during this trip. We strongly recommend that you carry a personal First Aid kit as well as sufficient quantities of any personal medical requirements (including a spare pair of glasses). The climate in Nepal varies a lot depending on altitude and time of year. During the summer (June-August) rainy season, it usually rains a few hours most days, towards the end of the day, only occasionally raining all day and for a few days at a time. It is useful to have an umbrella and rain cape. The rest of the year is generally dry, with the temperatures dropping in the winter. As there are limited heating facilities, be sure to bring warm clothes if you are coming during the months of November to February. In the spring and autumn, the weather can be warm, even hot if you are staying in the Terai, the plains in the south of Nepal. The day is spent visiting some of the major World Heritage Sites of Kathmandu. One of the most fascinating and important World Heritage Sites in Nepal, Bhaktapur is made up of three large squares filled with historic shrines and temples, Newar architecture and fine art. Famous for its clay pots and exquisite wood carvings, Bhaktapur is also legendary for its colourful festivals and its delicious and unique cuisine. 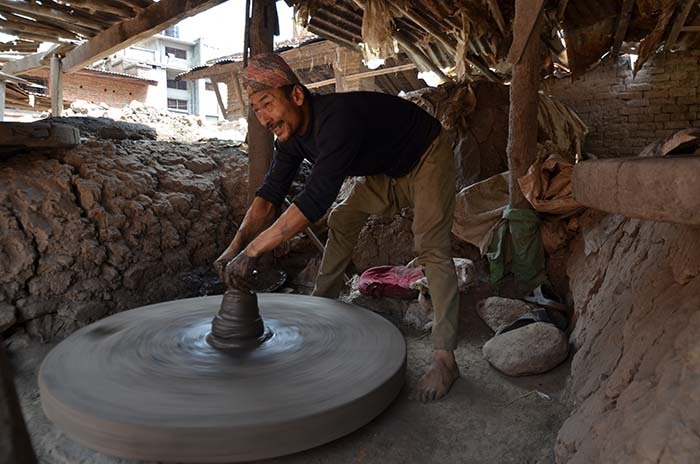 Bhaktapur retains its medieval feel and the local people are still engaged in farming and traditional crafts like pottery, metalwork, art and woodwork which have supported the city since it was established in the 12th century. This is a ‘must see’ place to explore! You will be shown the magnificent Golden Gate in Durbar Square (square of the palaces), the Palace of 55 Windows, the Nyata Pola Temple, Newar houses and pottery square. Although the town was damaged in the 2015 earthquake, there has been a lot of work to repair the old buildings. After having sightseeing of Bhaktapur city we will drive to Panauti. After being introduced to your Homestay host, you visit the old town centre. Panauti is an old traditional Newari village where you can see a large number of Hindu and Buddhist religious monuments and temples. Originally a small state given by King Bhupatindra Malla as a dowry to his sister, it is still largely unchanged over the passage of time. 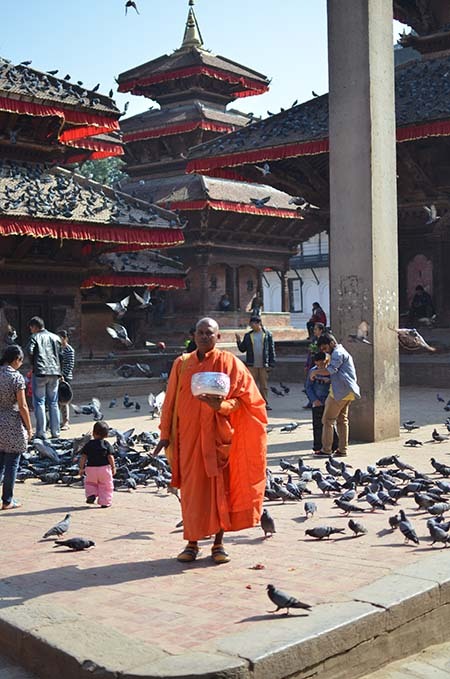 You visit Indreswor temple and Durbar square in the town centre. Situated at the confluence of the two rivers Rosi and Punyamati, it has been regarded as an important religious site since very early times. You have time to explore the narrow streets and medieval ghats with your homestay hosts. The next morning you are driven to Neydo Monastery in Pharping, about 22 kilometres from Kathmandu, a world apart in its little corner of the southern part of the Kathmandu Valley. Here you spend the night at Neydo Tashi Choeling Monastery Guest House. A Tibetan monastery, there are up to 140 monks living in the monastery from Nepal and India. The present Karma Charmé is the seventh reincarnate lama of in the unique Neydo Kagyu tradition, which also follows the Nyingma lineage Tibetan Buddhism. The monastery has Nepal’s biggest statue of the Amitabha Buddha flanked by statues of Avalokitesvara (Buddha of Compassion) and Vajrapani (protector and holder of the Buddha’s sacred teachings). You stay in the monastery’s adjoining guest house. Originally built to accommodate monastic visitors, it was under-used and it was decided to open it so that guests could stay. 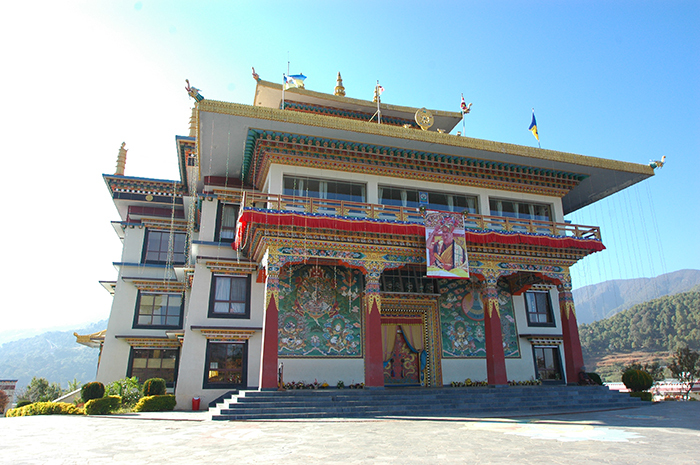 Now profits from the guest house contribute to the day-to-day expenses of the monastery. The rooms are all very comfortable with ensuite bathrooms, a kettle to make tea and coffee, and a private balcony. There are other wider balconies where you can also relax, admiring some of the stunning views across the Valley. Excellent meals are provided in the dining room. The monks are very happy for you to join them for their early morning and evening ceremonies in the main hall. Watched over by a towering image of the Amitabha Buddha, many people chose this peaceful setting for personal retreats, meditation, and courses that are given on Tibetan literature, Buddhist philosophy and ethics. Rising early for the morning prayer ceremony with the monks, after breakfast you are driven to Kurintar, about 100km from Kathmandu on the banks of the Trisuli River. Your lodge sits on a ridge in the middle of forested hills that slope down to the sandy beaches of the Trisuli River. Here you can find the tiny settlements of various tribal groups like Chepang, Dorai, Magar, and some Brahman and Chhetri people who eke out their subsistence from foraging in the forests, trapping the odd small animal or wildfowl, and cultivating wheat, rice, maize and vegetables. 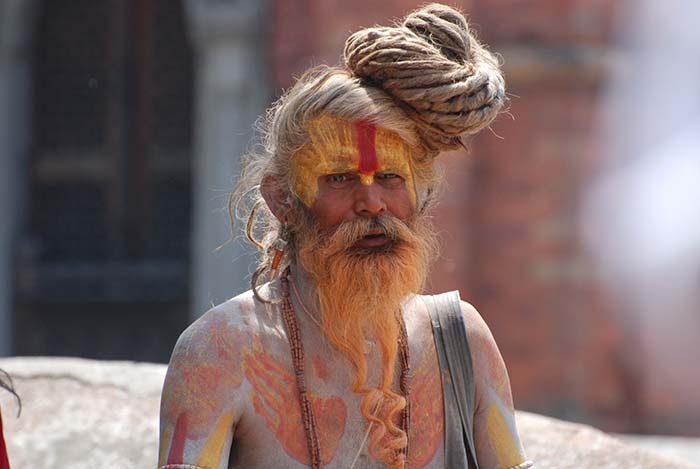 Typically animist, these people are the last of the hunter-gatherers who live in Nepal. After breakfast at your hotel, you are driven to Pokhara, about 3 hours away from where you will have the rest of the day at leisure. There are lots of things to see and do in Pokhara. There are a few museums, the most notable being the International Mountain Museum (IMM). In addition, there is an ethnographical museum, Pokhara Regional Museum and Annapurna Natural History Museum with collections of flora and fauna, and butterflies. There is also the Gurkha Museum featuring the history of the Gurkha soldiers. Gurkha soldiers are still recruited here in Pokhara. 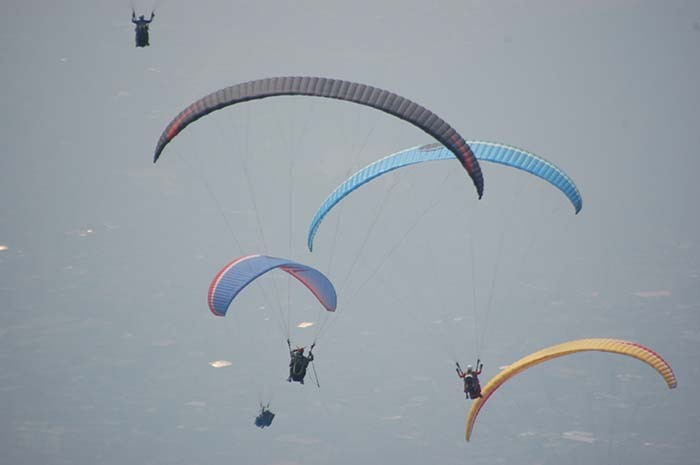 You might like to go boating or take the opportunity to try out paragliding. For the fearless, you might want to have a go at Nepal’s second bungee jumping site: Water Touch Bungee Jumping. Or if you are interested in Tibetan culture, you can take a tour of the Tibetan settlements with a Tibetan guide. 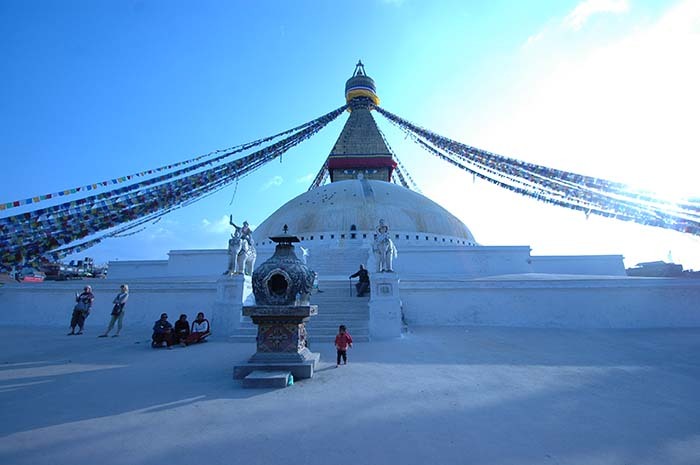 In the morning you are taken on a half-day sightseeing tour of Pokhara visiting Davis Falls, Bindebasisni Temple, the Seti gorge and also a visit to one of the Tibetan settlement camps. You go boating on the lake and hike up to the World Peace Pagoda which commands a view over the lake to Sarangkot and the mountains. The pagoda was built in 1996 and is 35m high. Its 37 steps take you to its second tier where there are four Buddha faces that look out in the cardinal directions. A standing Buddha in bronze faces south, while a Sri Lankan Buddha meditates looking to the west, a Thai Buddha faces north and a Japanese Buddha looks eastwards. Driving along the dramatic Siddhartha Highway, you pass landslide-scarred valleys as you climb and descend to the deep, steamy gorge floor of the mighty Kali Gandaki River. This “off-the-beaten-track” ancient hill town of Tansen is a fascinating place to look around. 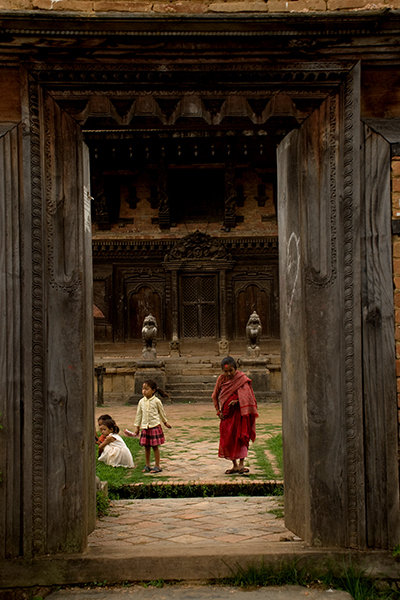 Explore its cobbled bazaar and admire its beautiful old Newari houses. In a historic area, Palpa was the seat of the Sen kingdom that ruled over this region from the 16th century for almost 300 years. In the evening you hike up the Srinagar Hill to the view tower for a beautiful panoramic view of Palpa and its surroundings. On a clear day you can see the peaks of Kanjiroba far to the west, Dhaulagiri, Machhapuchhare/Fishtail and the Annapurnas, Manaslu and Gauri Shankar. It is an easy hike of about a kilometre up from the bazaar. You are driven to Barauli Jungle Lodge in Chitwan where you spend the next couple of nights. Voted as number 1 by TripAdvisor in 2017, this stylish and luxurious jungle lodge hotel offers the best of Nepali hospitality. Located close to the Rapti River in Meghauli, you see the wildlife in and around Chitwan National Park during the two days of your stay here. Chitwan National Park was the first national park in Nepal and was set up 1973. It was made a World Heritage Site in 1984. With an area of over 932 km2 and an altitude of between 100 m to 815 m in the Churia Hills, it is home to 68 species of mammals. You may see the “king of the jungle,” the Bengal tiger as this is reported as being one of the best tiger habitats in the world. More commonly sighted are the one-horned rhinoceros, sambar deer, red muntjac, hog deer, rhesus monkeys, Hanuman langurs and wild elephant. You have the day free. You can visit Swayambunath Temple, otherwise nicknamed the ‘Money Temple’. On a hill overlooking the city, it is one of the most sacred Buddhist sites in the country. Not for the faint-hearted, there are 350 steps to the top, though you can cheat and take the back route, though less steep it doesn’t offer such good views. Lose yourself in Asaan, the area between Thamel and Kathmandu’s Durbar Square which is a warren of narrow streets where Nepalis come to shop for everything from the kitchen sink to saris and vegetables. Why not visit the elusive Kumari in Durbar Square, or go shopping in Thamel where you can find all sorts of souvenir shops selling handicrafts, local organic tea and coffee and other mementoes.